Oceanography is a very relevant field of study which influences sustainable fisheries, economic growth and the environment. We can divide oceanography in several ways. For example, we see the primary branches of oceanography as chemistry, physics, biology and geology. OCEANOGRAPHY – The branch of science that deals with ocean chemistry, physics, geology and biology. OCEAN CHEMISTRY: How chemical properties of oceans interact including marine ecosystems, ocean currents and fluid dynamics. MARINE PHYSICS: How ocean currents circulate including water column structure and fluid dynamics. MARINE BIOLOGY: How life in the oceans behave in their natural habitats. OCEAN GEOLOGY: How ocean currents circulate including water column structure and fluid dynamics. Even though, you can slice and dice oceanography in different ways…. 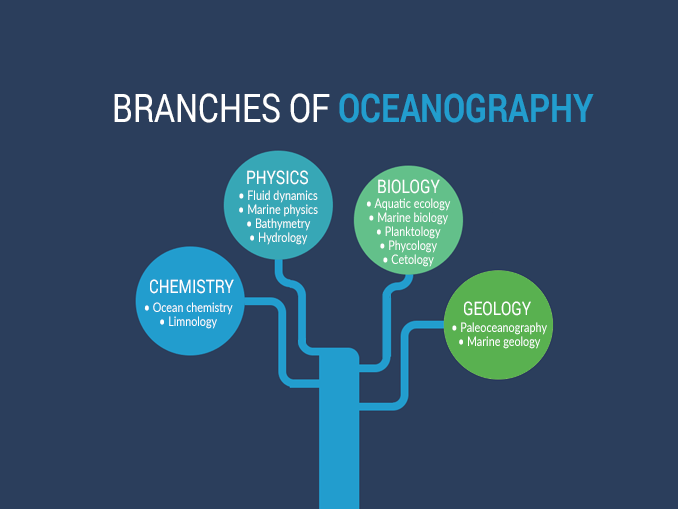 here’s how we’ve divided the branches of oceanography. Ocean chemistry or marine chemistry is a hot topic now. This is because climate change is happening from higher greenhouse gases into the atmosphere. About 80 to 90% of heat from global warming is going into our oceans. So the oceans are like a heat bucket absorbing 1000 times more heat than the atmosphere. As oceans become more acidic, ocean chemistry studies the chemical properties of oceans interact including marine ecosystems, ocean currents and fluid dynamics. LIMNOLOGY – How biological, chemical and physical properties of lakes and ponds relate (often) to their terrestrial surroundings. OCEAN CHEMISTRY – How chemical properties of oceans interact including marine ecosystems, ocean currents and fluid dynamics. Ocean currents are like giant conveyor belts flowing through the oceans moving huge amounts of water all the time. We use physics to measure the constant motion. For example, fluid dynamics measures how liquids mechanically flow in relation to forces acting on them. In a similar way, hydrology studies the movement of water on land. If you want to understand ocean depth, you’d perform a bathymetric survey with sonar. These sonar instruments map out ocean bathymetry – something scientists are still currently trying to achieve. HYDROLOGY – How water travels in relation to land. BATHYMETRY – How deep oceans, seas and lakes are relative to mean sea level. MARINE PHYSICS – How ocean currents circulate including water column structure and fluid dynamics. FLUID DYNAMICS – How liquids mechanically flow in relation to forces acting on them. Marine biology focuses on the interaction of oceans and life. For example, hydrobiology assesses how aquatic life in water is distributed, interacts and grows. Because fisheries is a major global industry, sustainable fishing is essential to its success. We use ichthyology to understand how fish species evolve and grow including taxonomy, anatomy and ecological importance. Small, microscopic organisms live in the often called plankton. Planktology focuses on how plankton drift in oceanic environment and contribute to carbon storage. MARINE BIOLOGY – How life in the oceans behave in their natural habitats. HYDROBIOLOGY – How aquatic life in water is distributed, interacts and grows. AQUATIC ECOLOGY – How fresh water (lakes, ponds, wetlands, etc) relate to flora, fauna, and environment. ICHTHYOLOGY – How fish species evolve and grow including taxonomy, anatomy and ecological importance. PHYCOLOGY/ALGOLOGY – How algae are distributed, grow and are classified in aquatic ecosystems. PLANKTOLOGY – How plankton drift in oceanic environment and contribute to carbon storage. CETOLOGY – How whales, dolphins, and porpoises evolve, behave and are distributed in nature. Finally, ocean geology studies the structures of the ocean floor. Geophysics, chemistry and sedimentology all ties into this subject. For example, paleoceanography better understands how ocean history is reconstructed including how they circulated and evolved in the geologic past. It also has deep ties with plate tectonics. As plates tear apart deep in the oceans, this is where we find the youngest rock on Earth. PALEOCEANOGRAPHY – How ocean history is reconstructed including how they circulated and evolved in the geologic past. MARINE GEOLOGY – How the chemical and physical structure and properties of the ocean floor has evolved, is composed and will transform.